A recreational rider from Centreville, Christopher Antonopoulu took a break with his son, Ian, during BTWD 2018 and spent a few minutes with FABB to talk about biking. Christopher likes to ride around his neighborhood and on the W&OD Trail. He told us that he rides to get outside and to take in the fresh air, one of the things he likes most about bicycling. Spending time with his son is another benefit of being outdoors on a bike. 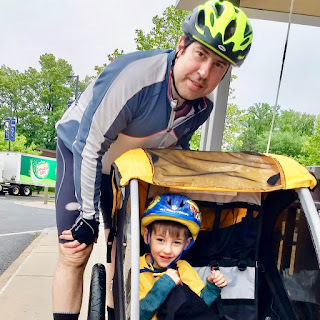 In response to our question about what he would change to make bicycling better in Fairfax County, Christopher told us he would like more and better connections between trails. FABB could not agree more. Better connections are essential to creating the trail and bike lane networks that will make commuting and other short trips by bike a viable option for more Fairfax residents. And FABB is working with the Capital Trails Coalition and other allies in the county to help make this happen.